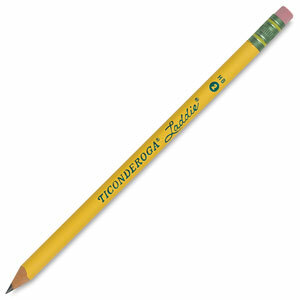 It's another classic from the makers of the Dixon Ticonderoga pencil. Laddie is Dixon's "intermediate" pencil. These slightly oversized (11/32") No.2 pencils can help youngsters make the transition from printing to cursive writing easily and comfortably. These intermediate pencils have a thicker, round, real wood casing that makes them easy to grasp, and easy to sharpen. They come with a thick graphite core that delivers a smooth line to help form letters clearly, plus pink erasers to erase cleanly. Made from reforested wood. Each box contains 12 unsharpened pencils. Non-toxic. These pencils feature Microban antimicrobial protection.